Is your agency prepared for this? Although I am not a licensed first responder, I have worked and supervised a New Your City Surface Transit Bus Maintenance facility and experienced firsthand some recoveries with our wrecker. I am also a trained Marine Corps combat Mechanic and have almost 20 years in mass transit. 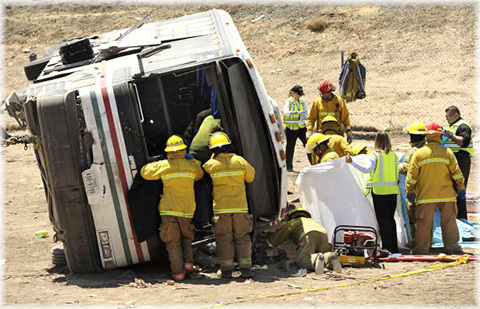 There are several unique considerations when dealing with a bus accident or fire, versus those involving a truck or automobile. This article is based on over the road and charter buses - these are your Greyhound type coaches, as well as Church and private organization transit vehicles. We are not talking about School buses, since most School buses are truck chassis’ with seats and seatbelts. Arriving on the scene there are several key questions to answer quickly! What is the passenger capacity of the vehicle and is it full to capacity? Many charter and over the road vehicles can carry upward to 56 passengers with toilet facilities. In a super quick triage how many ambulances are needed? Are there any passengers with physical challenges? What is the position of the vehicle; upright, upside down, or on its side and which side? The position is important because of the egresses into the vehicle, and the possible hazards that could be created by a vehicle’s position. Is it easily accessible or is it in a ditch? Is there a need to stabilize the vehicle with one or more recovery vehicles? A local gas station wrecker will have a hard time handling a 35 to 40 foot vehicle weighing in at up to 20 tons or 40,000 pounds curb weight (empty). Now we need to add the number of passengers times 150-175 pounds; this should come close to including the baggage weight. Where is the nearest heavy duty wrecker, and how soon can we get it to your location if needed? In an all-time emergency a Tractor (trailer) rig might help if there are heavy duty tow cables available; the rig could hold the accident vehicle from sliding while victims were being extricated. When planning a rescue, it is important to know the fuel type of the vehicle. Most buses run on diesel or gasoline with fuel tanks located under the floor, and can have fuel capacities of upward to 200 gallons. On a rare occasion; however, it is possible on a short round trip charter that you could find a Compressed Natural Gas (CNG) Fueled bus. These run close to a city, since fuel would need to be available for a return trip! Unlike standard fuel sources, CNG fuel tanks are mounted on the vehicle roof; they hold roughly 5600 standard cubic feet of CNG at 3600 PSI. A CNG blue and white diamond should be visible along with a shut off valve location decal. There is also a battery tray holding multiple batteries that should slide out on the driver’s side. There should be an emergency shut off switch on or next to the battery tray. The system could be either 12, or 24 volts, and the batteries could be either sealed or maintenance-required “acid” batteries. Depending on the vehicle there may be baggage compartments under the floor along with the battery tray. A quick check of the baggage area should be used to determine if there is any hazmat being transported, such as ammo for a gun club outing, or other type of freight a Greyhound bus might have on board. Flooring on most buses is made of one inch marine plywood, coated with petroleum-based under coating on the road side, and a rubber matting and/or carpet on the interior. It is flammable; however, if needed it can be cut for access, provided the seat legs or mounting locations are noted. The isle width should average about 18-20 inches, which is not an abundance of room for a responder wearing full gear. Most coach buses have one front door; transit buses will also have a rear door. These doors are located on the curb side only. The door release is located on a handle or switch to the left of the driver or a mechanical handle to the drivers right. There are emergency door air releases at all doors unless the bus is on its side curbside down. At this point the doors are not accessible. Any time the bus is on its side the best egress will be through the front windshield or a side emergency windows. Most likely there will not be a rear window since the engine will be on the lower half of the back of the bus and the air conditioner unit will take up the whole top half. All buses should have emergency roof hatches; they are used for both escape and ventilation. The roof hatches are fairly small and not practical for using a body board. The side windows should have a labeled as a lift-up or pull type latch to release the window to swing out from the bottom. The mounting of these windows is with a rubber hinge at the top which can be easily cut with a knife to remove the whole panel. This will usually create an opening of about 3 foot by 4 foot when the panel is removed. The front windshield is installed with a locking rubber gasket from the outside. Remove the long thin rubber lock with a small pointy tool then pry the windshield out away from the bus. It will come out fairly easily; once you are inside the other one(s) can easily be kicked out. There may be aluminum cross bar however it is easily removed with a cutting tool. Now you should have an opening roughly 8 feet by 3 to 5 feet wide, depending on the model of the bus. If the vehicle has been maintained properly the engine compartment should be relatively clean, meaning the compartment is steam cleaned from time to time and there are no fluid leaks. Note that there is an emergency shutdown switch inside the engine compartment. Any number of flammable liquids could be leaking: power steering, engine oil, transmission fluids, Freon, including fuel from lines or filters; unlike an automobile, these reservoirs can be fairly large. Other hazards may include toilet waste spillage and hazardous fumes from burning seats, both upholstered and hard plastic. From experience, I have seen busses that have burned to the bare metal rib frames. To reduce weight many bus manufacturers use plastic and fiberglass on both the interior and exterior. Once they start cooking everything seems to just melt and then burn. There are new challenges caused by the manufacturing of Advanced Steel that the standard rescue equipment cannot cut through. At this time I think it is safe to say that using the available egresses dealing with the new steel will be limited. Make sure you are keeping up to date for the future.